1. As you exit Heraklion Airport go straight ahead and follow the signs to the town of Agios Nikolaos. This takes you eastward on the national main road E75. 2. After approx. 60km you will be approaching the town of Agios Nikolaos. Pass through the town by turning left at the first crossroads where you see traffic lights and then, immediately, take a right at the following set of lights. This is the road to Elounda. 3. Follow the signs for another 8,5 km from the last crossroad and you will reach the small port of Elounda village. Proceed slowly and when you meet a big church keep on the same road. 100 meters later, you will find Elounda Garden Suites at your right handside. 1. As you exit Heraklion Port, turn left on the traffic lights right onto Nearchou Ave and then follow the signs towards the town of Agios Nikolaos. 2. Follow the signs. After the second traffic lights (in 1km), turn right to Agiou Dimitriou Ave. After 400m continue to Steliou Kazantzidi Ave for another 1km and then take the ramp to Agios Nikolaos. Keep right at the deviation and merge onto the national main road E75. 3. After approx. 60km you will be approaching the town of Agios Nikolaos. Pass through the town by turning left at the first crossroads where you see traffic lights and then, immediately, take a right at the following set of lights. This is the road to Elounda. 4. Follow the signs for another 8,5 km from the last crossroad and you will reach the small port of Elounda village. Proceed slowly and when you meet a big church keep on the same road. 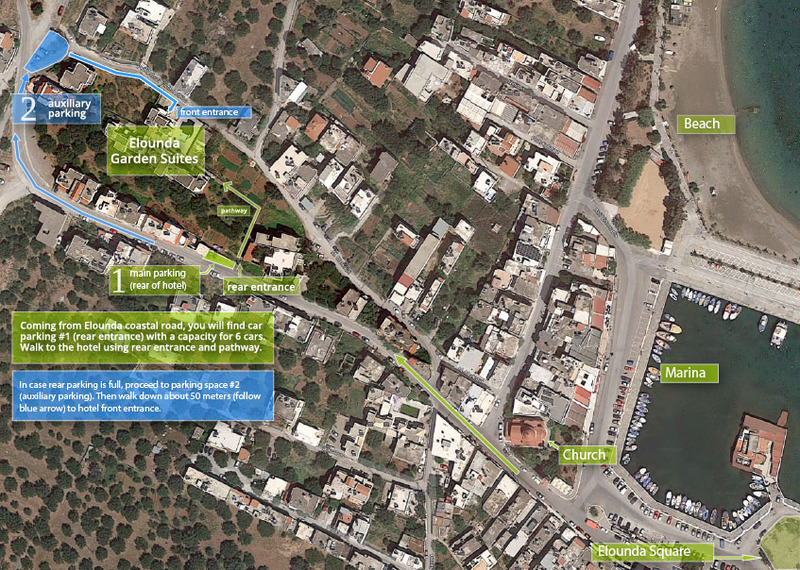 100 meters later, you will find Elounda Garden Suites at your right hand side.